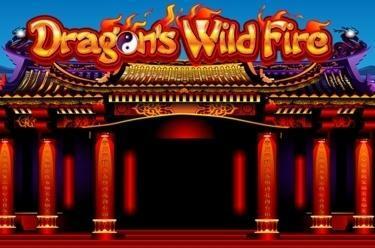 Play Dragon's Wild Fire online for free now! In Chinese mythology dragons have long been a symbol of luck - at Dragon's Wild Fire they will bestow this fortune upon you! This slot takes you to temple grounds in the Far East equipped with 5 reels which will see to it that your player account rejoices! 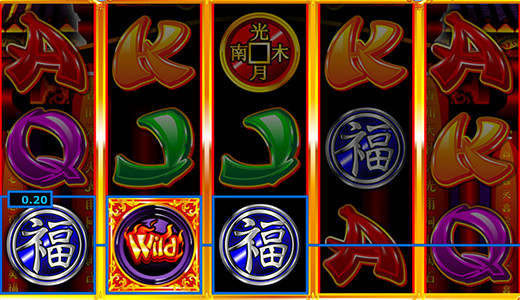 Many lucky dragons, a fiery Wild symbol and a Bonus symbol, which triggers 7 Free Games, are waiting to boost your luck! Your aim: Land 5 identical symbols along a win line. All win lines run from left to right in different patterns along the reels. You win if you land at least three same symbols side by side from the first reel on the left along a win line! 3 'Bonus' symbols on the second, third and fourth reel trigger 7 Free Games for you. The 'Stepping Wilds' will be activated in the Free Game - Wild symbols whose 'marching course' you can determine before every spin! Select left, right, up or down. As soon as the reels stop all Wild symbols will move in the chosen direction and replace symbols with Extra-Wilds until they have reached the edge of the reels. You can select the moving direction of the Wild symbols again before each round of the Free Game. You also have the chance to win further Free Games or the 'Flaming-Re-Spin-Bonus' during a Free Game! If a reel is completely filled with Dragon symbols, then all the Dragon and Wild symbols will be fixed. Then all positions will spin again without you taking out any more bets. If additional Dragon and Wild symbols appear these will also be fixed and you win a free Re-Spin. This will continue until no more improvements can be achieved. Then all winnings will be paid out.